The SJ200 is a true muscle-man, featuring enhanced ISPM-technology with vector control. Outstanding performance and design characteristics, such as superior torque for demanding applications and exceptionally compact size, for SJ200 inverter in a class of their own. They are suited for various applications in textile, paper and printing industries as well as for all areas of the metalworking industry, cranes and elevators. New Intelligent Sensorless Vector Control – NO Autotuning Required! 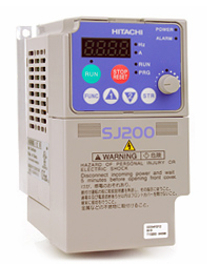 Hitachi’s SJ200 series AC drives are compact, high‑torque, full‑featured drives, yet are easy‑to‑use. Hitachi’s new technology inverter family is suitable for a wide range of drive applications. The SJ200 features high starting torque of 200% or greater at 1Hz.